Honor and chivalry: two concepts that once dominated the battlefield. While honor has stayed somewhat intact throughout the years, chivalry has fallen by the wayside in the face of the overwhelming desire to simply make it home alive. Imagine, if you will, throwing out every thread of common sense that you have and being forced to stand in a line and fire upon your enemy. Not with rifles or even machine guns, mind you, but a musket. While this concept sounds like something out of the American Revolution, it's actually one of the more shocking aspects of Studio Gonzo's latest anime masterpiece, Last Exile. The cloudy world of Prester has fallen on troubled times. The world has been split into two opposing kingdoms, Anatory and Disith, by a long stretch of turbulent space known as the "Grand Stream." In some ways, Prester's disjointed masses of floating land are reminiscent of those seen in the video game Skies of Arcadia. In order to travel to other destinations, one must literally fly there. Money, machine parts, and even clean water are all in short supply, making life for Claus Valca and Lavie Head that much more trying. In order to make enough money to get by, Claus and Lavie have teamed together to run a small courier service. Frail-looking Claus is the acting pilot in the outfit, while Lavie takes up the slack as the navigator. Both of them grew up together and learned the secrets of their trade from their fathers. Having this heritage actually helps to keep these two brave pilots a head above the other vanships, a form of propeller-less airplane. Their long-term goal is to someday be able to brave the Grand Stream and make it back to tell the tale, a feat Lavie's father died trying to accomplish. As the story begins, Claus and Lavie have been honing their flying skills for the chance to win the great vanship race, the "Norika Cup." They failed to place in the time trials due to a mishap on their last job, and must start the race dead last. Claus manages to bring his ship into the lead, but just as he and Lavie are nearing the finish line, another ship comes out of nowhere and crashes into the trees below. The two forfeit their lead in order to check for survivors and unwittingly find themselves the recipients of a seven star mission to deliver a little girl named Alvis "Ai" Hamilton to the unbeatable air cruiser, The Silvana. Transporting a girl might sound easy, but with a ravenous robot as cunning as the Nemesis from Resident Evil 3 hot on Ai's trail, this mission is one that could spell certain doom for Claus and Lavie. 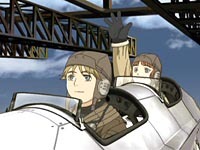 Spanning twenty-six lush and addictive episodes, Last Exile stands as studio Gonzo's 10th anniversary masterpiece. 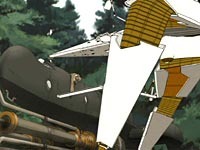 Brought to life by director Kouichi Chigira (Full Metal Panic, Gatekeepers), character designer Range Murata, and production designer Mahiro Maeda -three of the men behind one of the first true breakout CG anime series, Blue Submarine No.6- Last Exile takes on a truly epic scale that is evident from the moment the opening credits roll. The disorienting bagpipes and dizzying in-and-out beats of the series main theme, 'Cloud Age Symphony', sets the initial mood, and the story takes care of the rest. 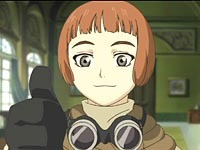 Unlike other shows that jump right into the action, Last Exile takes its time to introduce the world and its characters. It isn't until the end of the third episode that the viewer truly "knows" where this epic story may be headed. Above all, the series is a character drama more than an action series. The elaborate sky chases and battles are merely a vehicle to propel this classic 'good versus evil' drama forward. The story is sound, the animation is simply stunning, and the passion that each staff member has poured into this series combines to make this a series that stands out from the crowd. 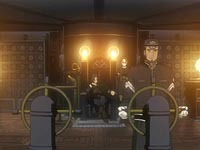 Last Exile's main trademark is its early twentieth century look and feel, and shares some similarities to that of pre-war Germany. This is a series about flight, but not just flight as in flying, but flights of fancy. It's a breathtaking series that will leave any viewer intrigued through all seven volumes. L/R: "Everything They Touch Turns Into Excitement"
Animefringe Top 25 Results 2004! Sorcerer Hunters: Chocolate, Springs and Other Hot Things!